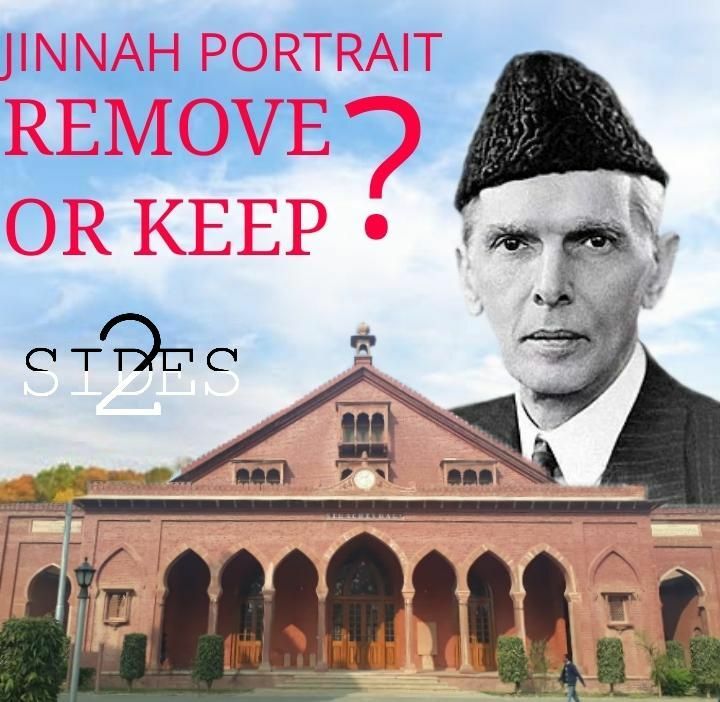 Jinnah Controversy - Keep or Remove the Portrait? HomePoliticsJinnah Controversy - Keep or Remove the Portrait? Jinnah portrait row: AMU students' union to intensify stir. ~Business Standard. The much sensationalized row over Muhammad Ali Jinnah’s portrait hanging in the Students Union Room of Aligarh Muslim University started on May 1 when Aligarh BJP MP Satish Gautham wrote a letter to Vice-Chancellor Tariq Mansoor, objecting to the display of Pakistan’s founder in the institution. Shortly after, on May 2, Hindu Yuva Vahini (HYV) activists protested against the portrait on the campus and briefly clashed with AMU students, reportedly injuring 41 people. The controversy is a genuine one. The culpability of Muhammad Ali Jinnah in India’s partition and the subsequent horrors are recorded in history. In 1940 Jinnah and the All India Muslim League he led authored and projected onto the national psyche the two-nation theory to carve out the distinct Muslim majority nation of Pakistan from India. Despite priding himself as the sole spokesperson for all Muslims of India, his agenda was flawed – an illogical strategy that says Muslim interest must be protected by consolidating Muslim majority provinces into a separate nation. The move would clearly endanger Muslims in Indian heartland, while at the same time offering little additional protection to the Muslim population in the newly formed state of Pakistan. To fulfil his own vaulting political ambitions, Jinnah set in motion events that, over many generations, have harmed the Indian subcontinent more than any other single individual could possibly have. The portrait of such a man, who has done a huge disservice to the cause of Indian Muslims, hanging in one of the most respected educational institutions in India is nothing short of an insult. To keep the legacy of Jinnah alive in the crucible of learning that should be AMU is a wrong that should be set right sooner rather than later. The argument that the portrait has been hanging for more than three-quarters of a century with no objection is built on the farcical ground that time makes a wrong right – akin to arguments that social evils like instant talaq have the weight of history behind them and thus rationality is not applicable. That the students of India’s premiere Muslim institute itself protesting for this cause – to retain the portrait of a man who sacrificed Muslim interests for his own benefit – is a sad state of affairs. The AMU controversy is not about Jinnah. It is about imposing the politics of a majoritarian government on an institute of learning. The row is a glaringly contrived one – happening as it is after permission was denied to hold an RSS ‘sakha’ inside AMU premises and with the HYV protests precisely happening on the day ex Vice-President and AMU alumnus Hamid Ansari was to deliver a speech at the university on the subject “India has failed to establish a pluralistic society”. It is nothing but a ploy by right-wing groups to further polarize society ahead of the Karnataka polls and the 2019 general elections. To be clear, the AMU students are not protesting to keep Jinnah’s portrait, but rather, they are protesting the attack on campus by the right-wing activists. Jinnah was a founding member of the University Court and had been conferred lifetime membership. This is the reason why his portrait has been hanging in AMU since 1938, and not because he is held in reverence in the institute. The tactic, however, is clever; cornering the opposing party – the academic institution - into a corner where they either have to succumb to the intimidation tactics of the government or appear as if they are supporting Jinnah. The AMU controversy is not about Jinnah and his portrait, rather it is about upholding the rule of law and not bowing down to browbeating of fringe elements. It is about resisting the forces aiming to demonize a section of the population and divide society to further their own agendas – much like what Jinnah did. Muhammad Ali Jinnah embodies an uncomfortable historical truth, one which touches a raw nerve for all Indians. However, burying such truths by force, away from eyesight and with no legal force behind it, is the work of a dictatorship and not that of a democracy.